I almost didn't see Dragon Commander. After a 30 minute presentation of another game with publisher Larian, I erroneously walked out of the cramped briefing room and started heading to my next appointment. Luckily, a lovely blonde PR representative chased me down the corridor and, struggling to make her thick accent understood to my uneducated ears, literally dragged me back to the booth. Warily, I sat myself down in a beanbag and prepared myself for a presentation about a game I'd never heard anything about. All I knew was what was depicted on the giant poster positioned above me. 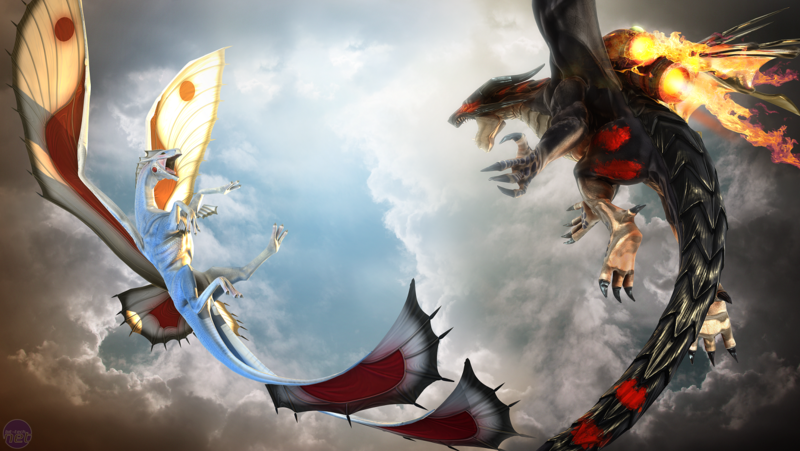 It showed two dragons brawling in the air. And both of them were wearing jetpacks. Before I can think to even begin disassembling the logic of that choice though, the presentation begins and an assault of information rushes towards me. 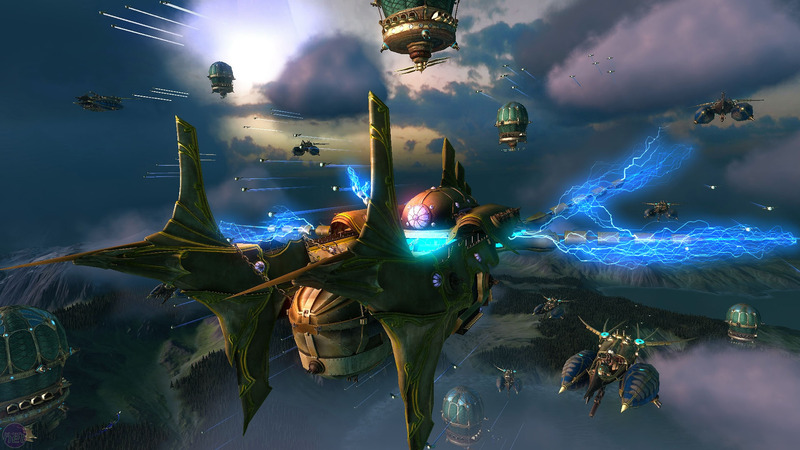 Dragon Commander is set in the Divinity universe, one set long before the likes of Divinity II, and it explores the glory days of the Dragon Commander universes. I'm nodding in response to this, but I'm not really taking it all in – I'm still stuck on the idea of dragons with jetpacks – but it's slowly explained that these commanders are humanoid warlords with the power to shapeshift to dragon form. A dozen questions bubble up in my mind, but all are silenced when the TV screen turns on and shows... a skeleton princess with apples thrust down her dress to provide, um, relevant curvature. Dragon Commander is a game made of three parts, it turns out. The first part sees you directly in the role of your principal Dragon Commander, on board his flying fortress, talking to your advisors and playing politics with your minions and dependants. In this demo the skeleton princess is your new bride – one desperate for biologically infeasible attentions and your support in founding her own undead nation. Will you support her, she asks? You'll have to turn against your dwarven smiths to do so, but while you'll lose the valuable weapon upgrades of those beardy smiths, you'll get a powerful necromatic army to command. Which leads to Dragon Commander's second stage – the tactical map. Here you look down on the world and plot which territory to invade next, moving your flying base around and playing your units as cards in your hand. When you've finalised your plans here, Dragon Commander brings out the ace in its sleeve – letting you fly freely as a dragon in 20 x 20km maps. AI allies fill the skies around you, obeying your orders and trying their best to keep foes off your back as you lay fiery siege to your enemy. Somehow, Dragon Commander manages to be a beast of an arcade flight-sim, as well as an RPG and a tactical game; the card collecting and map-based planning culminating in fire-breathing action. Many of the details are missing, I'm told. Larian hasn't yet balanced the game at all and a lot of the content still has to be made. There's talk of stealth missions where you hover through volumetric cloud cover at night, of over-ocean races and all-out war with up to four other players. The core rules of the game are there and Larian knows what it wants to do, now it's just a matter of linking the story up with the design and providing a steady feed of unique action. As I stand to leave (again) the designer - who says he doesn't have a business card to give me, as he never leaves the office - asks me what I think. 'I'm not a PR, so give me your real thoughts and suggestions,' he says. With no release date yet nailed down, he's hopeful he can still improve the game greatly. I shake his hand and, just before I'm ushered back to the GamesCom business centre, tell him to change as little as possible, because it's already fantastic. You can follow Dragon Commander via it's official site, and bit-gamer would also like to thank the lovely blonde lady that dragged our intrepid reporter back to demo room. Check our GamesCom 2011 news hub for all the information from Cologne this year. UPDATE: Credit where it's due, the lead designer I spoke to was Larian Studios' Farhang Namdar. Beats funding goal on day one. Bethesda's Dishonoured stole the show for us at GamesCom 2011 this year. Here's a taster why.